“Tourbillon: Gold” model cufflinks made of 750 white gold with black carbon interior. “Tourbillon: Gold” model cufflinks made of 750 white gold with black carbon interior surrounded by 108 pcs of VS F/G diamonds of approximately 0.60 cts. “Tourbillon: Gold” model cufflinks made of 750 white gold with black carbon interior surrounded by 80 pcs of black diamonds of approximately 1.05 cts. “Tourbillon: Gold” model cufflinks made of 750 white gold with silver carbon interior surrounded by 80 pcs of sapphires of approximately 1.10 cts. 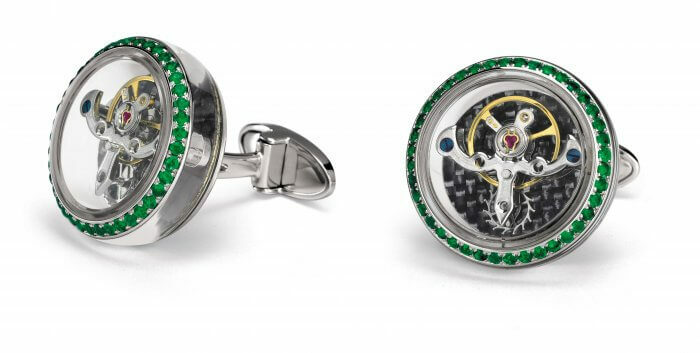 “Tourbillon: Gold” model cufflinks made of 750 white gold with black carbon interior surrounded by 80 pcs of emeralds of approximately 1.05 cts.